We would like to thank everyone for an amazing response we got. We are closing the registrations to finalize draws. There may be few open slots in Mixed and Women’s category. If you are interested, please email us to confirm at contact@bostontennisfriends.com . Sincere appreciation from the ‘Boston Tennis Friends’ group to you for enrolling for a noble cause. Your participation fees will be donated to ‘Dana Farber Cancer Institute’. Payment Receipt: Please bring your PayPal receipt along with you for the tournament. If you have any issues with registration, please call (978) 496-8660 or send email to admin@bostontennisfriends.com . 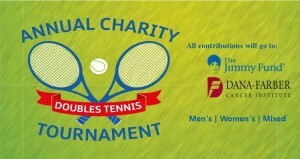 • This event will feature both men’s, women’s and a mixed doubles draw. It is an “open” tournament that welcomes players of all ages and levels.